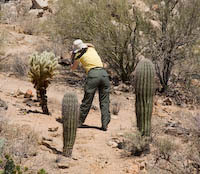 These are our favorite photos from our April 13, 2012, visit to Saguaro Park West near Tucson, Arizona. Saguaro cacti with the moon. 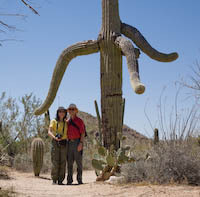 Getting a hug from a saguaro. We hiked several trails and took lots of photographs. The teddy bear cactus isn't as cuddly as it looks. 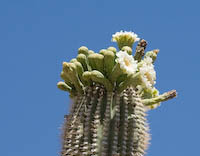 The Sonoran desert is densely populated with a wide variety of flora. 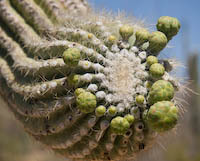 New buds on the end of a saguaro arm.